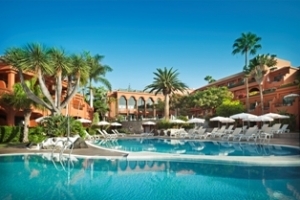 The Adults Only Hotel Colón Guanahaní is an exclusive four star hotel in the South of the Island of Tenerife. Enjoy a luxury holiday without children in this small and attractive colonial-style property, just a few meters from the Playa Fanabe beach. First class gastronomy, welness area, modern rooms with batrhrope, slippers and also free wifi access will spoil your holiday at its best. Golf players will also find their spot here, as the hotel offers special discounts for several golf courses, close to the establishment. If you wish to enjoy a calm and relaxing holiday, then stop looking further.